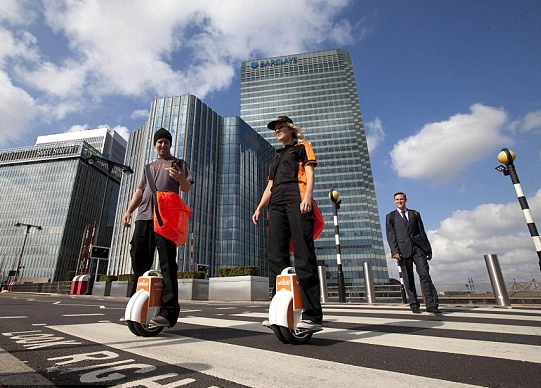 Express delivery with an electric unicycle, you seen it? Whistl postal company is well-known in the UK, reported that the reason for making the trial to give 100 employees Q3 Airwheel unicycle, is to improve the efficiency of the staff, "new things worth trying Moreover, our staff is very boring, should bring them a little joy", Whistl company official said. 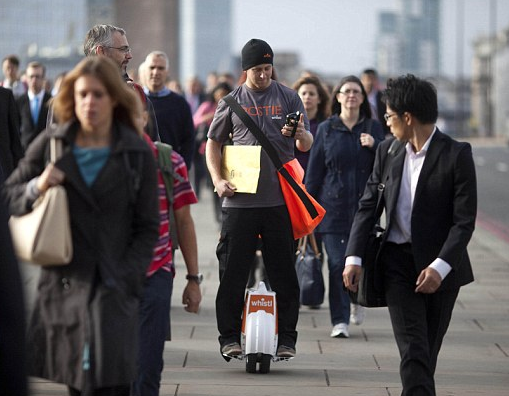 It is reported that Airwheel Q3 unicycle,the top speed is 18 km / h,can be automatically charged when goes downhill , the biggest advantage is that with a large unicycle can reduce car traffic light and waiting time cost to send a courier when traffic jams, but also to avoid the a large-scale vehicular traffic in some areas inconvenient embarrassment. Postman riding a unicycle express delivery process can be done in the crowd walking freely, unimpeded. But what attracted Whistl special company? Airwheel Q3 made of modern environmentally friendly materials, is the world's longest mileage of the smart car, built the original Sony battery, rechargeable 1800 times, top speed of 18 km / h. Q3 use the most advanced processors in the world, is the leading processor architecture and stable central processor to ensure smooth riding process.The most exotic places on Q3 is it can charging when goes downhill, this feature is not available to other wheelbarrow, while riding while charging, really convenient. In order to ensure that the postman will not be upset about recharged battery exhaustion, it greatly improve the efficiency in the delivery process. Airwheel wheelbarrow on the safety performance of R & D spending for a long time to develop an intelligent protection system ensures that each car's safety. When the speed over 12 km / wheelbarrow pedal slowly lifted the front end, making more difficult to move on when the speed increase, and when the car is less than 15% of electricity consumption, LED flash will all play, the buzzer will sound, tilt protection when it is tilted more than 45 degrees, for example, fell to the ground after the wheelbarrow, the motor will stop the movement, will not cause any harm to the human body. With these protections, the postman courier delivery process is bound to fast without pressure. Airwheel Q3 maximum load 120 kg, the car weight 13.7 kg, is not required when riding can carry only lightly, bearing 120 kg, quite suitable for the postman to use, they can put the package in the bag when riding, then postman will be standing on the Airwheel wheelbarrow,wheelbarrow no-brainer, quite flexible, and even muddy gravel roads are no problem. Airwheel this paragraph Q3 wheelbarrow price in the UK is £ 799, which will be Whistl this is one of the reasons the company selected. Whistl official said, the trial after the company would consider giving all employees a wheelbarrow as a working person dedicated delivery vehicles, such large-scale buying, the company is bound to consider spending problem. And after similar products on the market and have done comparison,Airwheel absolute value for money, not any worse than the market, a wheelbarrow, feeling to spend the premium price to buy. Employees are also back after use are good, everyone says, is proud to be selected by trial Airwheel wheelbarrow, now go to work every day feeling really great, the case never appeared anxious waiting for the bus, customers see riding wheelbarrow delivery courier delivery staff will talk for a while, we all feel very cool. It is reported that, Whistl staff --- was formerly TNT Post - since in London, Liverpool, Manchester and Birmingham trial Airwheel Q3 on wards, took delivery of the items the shuttle in the crowd, causing passers consistent wonder the streets of London, we are curious watching the magic wheel, quite attractive. Postal company responsible person, long before the idea had sprouted to change the way of express delivery, courier work itself is relatively boring tired, if you can mix business and pleasure, all the better. Airwheel wheelbarrow appeared suddenly grabbed everyone's attention, so we feel it is not a non-final choice Arwheel in Q3. "Let the employees at work feel a lot of fun, and even clients have a very good reflection of the future of the British postman will begin using the wheelbarrow." Whistl such person in charge said.